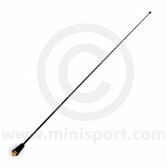 Find an aerial for your Classic Mini online here in Mini Sport’s Electrical & Lighting department. We stock both the wing mounted chrome aerial fitted types for Classic Mini models until 1996 and the roof mounted base and mast types used on the MPi Mini from 1997 onwards. 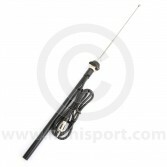 These top quality aerials have been made to the highest standard and can be fitted simply and conveniently. Mini Sport stocks a huge range of Electrical & Lighting components for all models of Classic Mini including Headlamps, Horns, Spot Lamps, Bulbs, Interior Lights, alternators, dynamos, starter motors, distributors and ignition systems. Chrome Aerial - Mini Front Wing Fitting.